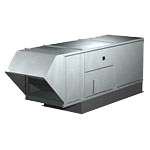 Typically used in HVAC systems built for commercial and industrial use, a Makeup Air Unit(MAU) is a large air handler that conditions 100% outside air for interior use as an alternative to recirculating stale air that could carry odors and bacteria. MAUs should be considered a requirement for restaurant businesses because it prevents the fumes from the kitchen from being reconditioned and circulated throughout the restaurant. The outside air coming into the kitchen via the MAU will assist in moving the fumes out the exhaust hood. Negative building pressure is also a concern that MAUs tackle. When the pressure of a building’s air is negative, it becomes difficult to open doors and when an exterior door is opened, a rush of air, that could be polluted and carrying debris, infiltrates the conditioned interior of the building. Having conditioned outside air circulated and stale indoor air exhausted eliminates this problem. Preventive Maintenance is required twice per year. At the beginning of the cooling and heating seasons. Check switch operation and repair as required. Check cleanliness of fan wheels and clean as needed. Check belt tension, wear and alignment and replace if necessary. Check drive alignment, wear, bearings, coupling seating and operation and repair and replace as needed. Check motor and only lubricate if grease fitting are present. Clean drain line and pans. Clean heating and cooling coils. Check flu and clean of debris and buildup. Check exchanger for cracks, replace if cracked.